Can’t get enough chicken wings? Try kicking your wings up a notch with a couple of secret strategies! 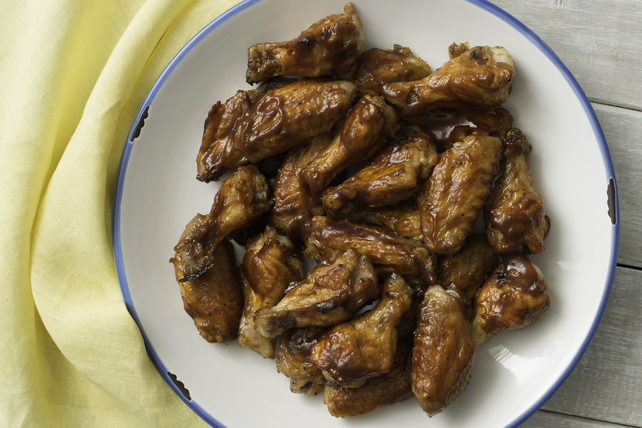 A simple dry rub and a little BBQ sauce create a perfect sweet and tangy glaze for these easy, yet flavourful, oven-baked wings. You’ll never believe how easy these wings are to make. Once you try them, we guarantee they’ll be making an appearance at every game night, potluck and backyard cookout in your future. Cover rimmed baking sheet with foil; spray with cooking spray. Place wing pieces in large bowl. Combine dry seasonings. Add to chicken; mix lightly. Spread onto prepared baking sheet. Turn wings over; brush with half the barbecue sauce. Bake 10 min. or until done, turning and brushing occasionally with remaining barbecue sauce. Prepare using 24 chicken drumettes. Serve with a mixed green salad tossed with your favourite Kraft Dressing. Or for a change of pace, serve with carrot and celery sticks dipped into Kraft Crumbled Blue Cheese Dressing.